Whether you’re looking for a compact recycling bin for your business or you want to replace damaged curbside recycling bins at your restaurant, these receptacles are just what you need. Do your part to reduce litter, and dispose of cans, glass, paper, and plastic in a responsible way with these commercial recycling bins. Consider placing these recycling bins next to an outdoor trash can to create a convenient waste disposal area. 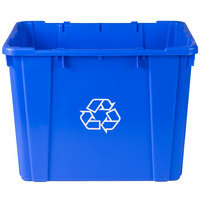 For additional commercial waste bins, check out our indoor wastebaskets and outdoor wheeled trash cans. If you're wondering where to buy continental curbside recycling bins, we have a large selection of continental curbside recycling bins for sale at the lowest prices.